Lavender Vinyl, located in the Historic 25th Street neighborhood in Ogden, houses an eclectic and well-rounded mix of vinyl records in many different genres, and has already made an impact on Ogden’s music scene despite having only been in business for less than a year. “[The first eight months] have exceeded my expectations,” says co-owner Kylee Hallows. “I felt that there was a need for [Lavender Vinyl], and felt that we were the right people to do it, but the community has just gobbled us up—they’re supporting us so much.” Along with co-owner Blake Lundell, the two run the shop with the community in mind, often collaborating with different local businesses to bring about a sense of unity in Ogden. For Hallows and Lundell, the name Lavender Vinyl serves a similar purpose, drawing a parallel between the serenity that comes with music and the calming effect of lavender. It also plays into the notion that lavender, a crop that thrives in Utah, can mean that the independent, local record store can flourish in Utah’s environment. As one of the only independent music stores in Ogden, Lavender Vinyl is serving a long-standing need for a record-specific shop that specializes in many different kinds of music, which has already made Lavender Vinyl a popular stop in Ogden—a bit of a surprise to both Hallows and Lundell. 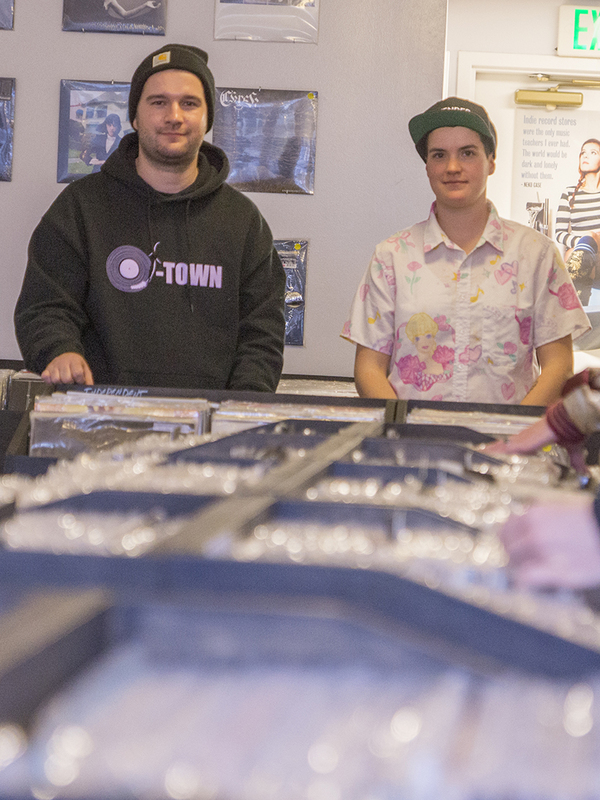 As a result, Lavender Vinyl has significantly expanded its inventory from when they first opened and plans on continuing to expand their musical offerings. “That’s the goal—to keep on growing our inventory and having stuff that people want, showing them something new while we’re at it,” says Lundell. As a store that specializes in selling records and record players, the increasing popularity of an “old-fashioned” way of listening to music is something that Hallows and Lundell believe will always have a place with music lovers. Despite the fact that the internet has made streaming music incredibly easy, there is something special about owning and collecting records. “I think it’s just the ritual of having something physical to hold or going into the store and finding something that you might not ever have seen or heard before,” says Lundell. “The internet feels very impersonal. It’s curated to specific [tastes], like, ‘You should like this—this is all you can like.’ It’s a box for any genre, when it should be more than that.” The curiosity of selecting music based on what the album cover looks like or listening to an album as the artist intended is a feeling that Hallows and Lundell want to inspire for the customers who walk into their shop.